Pointy-Haired Bosses* are splashing AI about their organisations without a clue about why they're doing it, says a senior Gartner analyst. "As head of customer experience, the logic is: we have to deploy AI because everyone else is doing it. In fact, there's not a huge number of companies that are actually deploying AI," Jessica Ekholm told us. Gartner estimates that only 4 per cent of CIOs polled in its most recent survey had invested and deployed AI, if you count chatbots as AI as Gartner does. Another 21 per cent of CIOs were experimenting with it. The top use cases are around customer engagement, call centre support and digital marketing. That's 81 per cent of organisations giving the technology a steer. Depressingly, the main motivator is saving money. "To some extent saving costs has been the major proposition," confirmed Ekholm. "But to make it work there needs to be a business value proposition. The key point is the customer journey." Two years ago Facebook and Microsoft kicked off a chatbot arms race, with Microsoft CEO Satya Nadella positioning "conversations as a platform" as the next era in human-computer interface. "Bots are the new apps," the SatNad told developers at the 2016 Build conference. "People-to-people conversations, people-to-digital assistants, people-to-bots and even digital assistants-to-bots. That's the world you're going to get to see in the years to come." Facebook thought so too, and pointed to its enormous consumer reach (of two billion users of Facebook, Instagram, WhatsApp and Messenger) to persuade businesses that it was the best channel through which to engage people. But Facebook's M messenger ran into trouble, with a reported 70 per cent failure rate. M was later repositioned as an experiment before being taken out the back and shot in January. We did find one area where chatbots work well, and it's an interesting one. They're a popular alternative to the hated IVR phone menu ("... press 3 for sales") as they have just enough context to guide the user to the right destination. They're not pretending to be a human, and so this is one technology supplanting another, rather than technology supplanting human. This user got higher sign-up rates with a chatbot. So it's not all sad. However, Gartner remains bullish about the prospect of anthropomorphic AI making something of a real-world impact, predicting that 20 per cent of customer service interactions will be handled by AI conversational agents by 2020. The confidence seems to be based on an apparent willingness of the public to accept algorithmic control – at least in some situations. Gartner polled over 4,019 consumers in the US and UK, and not surprisingly found a willingness to hand over autonomy in situations like car navigation (64 per cent appreciated assistance), health monitoring (59 per cent) and time scheduling (58 per cent). The number fell to 34 per cent for shopping suggestions, 32 per cent for actually driving the car (rather than navigating) and 22 per cent for "Select my outfit for the day". 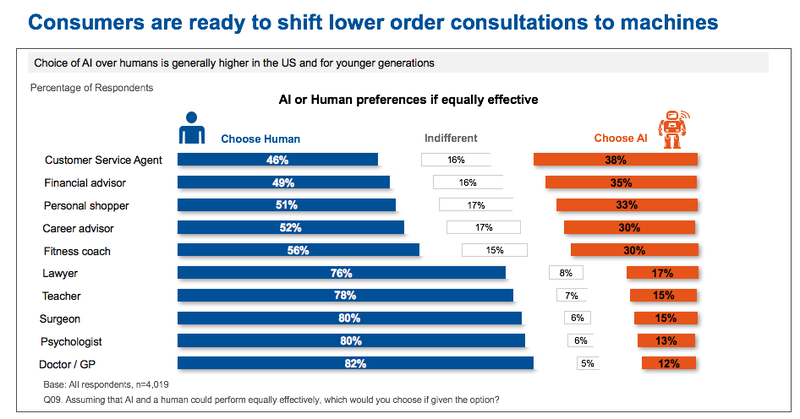 Not surprisingly too, only a small majority wanted an AI to replace a teacher, lawyer, shrink or doctor.